Designed for e-readers, tablets, planners, large manuals, or reference materials, the Booklift Copyholder features two patented adjustable clips to hold pages open at the desired location. Nine height adjustments provide a variety of viewing angles. The flexible easel design includes a nonskid base. Fold flat for compact storage and portable ease. 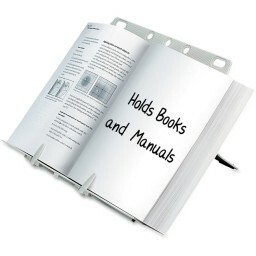 Copyholder accommodates standard letter-size ring binders and holds up to 10 lb. at a time.